I recently signed up to Birchbox. 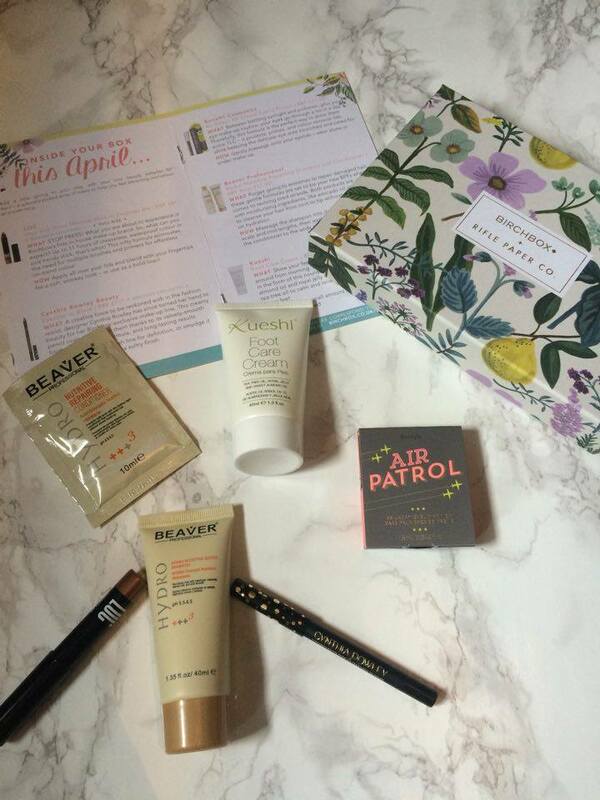 Birchbox sends you 5 luxe products for £10 which is fab. I've seen a lot of people talk about how great the things inside the Birchbox are and I for one am very impressed with what you get for £10 so I was very excited to try it. First of all, I got to choose the design on the front of my box as they teamed up with rifle paper co for this box, stunning. The presentation is gorgeous and I'm loving the floral theme. Inside there's a little booklet to tell you what you've got and how to use it, which is quite helpful and it includes some product recommendations. There're a couple of coupons inside for rifle paper & co. Which is great (We all know I love a bargain!). The One and done shadow stick in empress me. This is a brand from Birchbox. their first in-house brand!. It's an all one eyeshadow stick which you don't need primer with and you can just blend it in with your fingers. no need for multiple brushes. I used this today and I absolutely love it. This is RRP at £8 and I received a full-size product. The colour is gorgeous I love it. The Cynthia Rowley beauty eyeliner in black. This is a smudge proof eyeliner which omg I can not wait to try out. It's very creamy and gives a velvety smooth finish. This is RRP at £11 and is absolutely brilliant. Benefit cosmetics air patrol BB eyelid primer. THE BENEFIT GOODIE!. I was super excited for this one because there's so much hype around benefit but I'm yet to try their products. This is a primer that protects and corrects lids. You can wear this alone or under makeup. I have been after an eye primer for a while and if I get along with this I'll certainly repurchase. This is RRP at £21.50. The beaver professional hydro nutritive repairing shampoo and conditioner. I haven't heard of this brand before. They're shampoos and conditioners which contain ingredients such as avocado and aloe vera to cleanse and hydrate your damaged hair, They sound great and I'm excited to try these. They're RRP at £11.50 Which is quite affordable for the quality. This is a foot cream with almond oil and royal jelly in. I've been after something like this as I tend to sort of neglect my feet when it comes to moisturiser and general skincare (note to self - stop doing that) so this is great. This is RRP at £12 and if I get along with it I'll most certainly repurchase. Do you use a subscription box?.